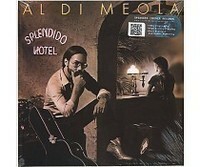 Al Di Meola (Jersey City, July 22 1954) is an American fusion guitarist. He was a member of Chick Corea's band Return to Forever, and played with, among others, Paco de Lucia, Herbie Hancock and Gonzalo Rubalcaba. He plays mostly acoustic, but always with the plectrum. He decorates his performances regularly with various omlijstende show effects. 2018 EU reissue on 180g 45RPM 2LP -"NEW STUDIO ALBUM BY THE GUITAR GENIUS & GRAMMY AWARD WINNER - 11 BRAND NEW SONGS - incl. Downloadcode"